Days after being affected by a 6.7 Magnitude earthquake, a landslide has hit the Sikkim-Bengal border, resulting in the death of an unspecified number of people. On Thursday, at around 5:30 am, a large chunk of 150 metres rock broke off a hillock. After that, it crashed down on a stretch of the national highway connecting Sikkim and West Bengal. A rescue team rushed to the affected area, till 8:30 am, one body was recovered, and three people including two boys have been saved. There is a possibility that about 4 to 5 more people are still buried under the debris, and rescue work is in progress to take these people out. Yesterday, Gangtok had received light rainfall, and hilly areas around the capital city of Sikkim might have recorded some good showers as well. Also, experts had not ruled out the possibility of landslides post the earthquake episode. Both the activities together may have resulted in the occurrence of landslides over the area. 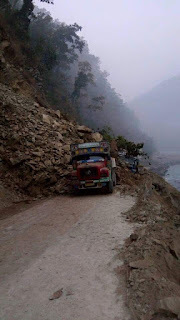 The national highway connecting Sikkim to the rest of the country has now been blocked due to the landslide. The incident took place on NH10, 1 km away from the Bengal-Sikkim border, which is 75 km away from Siliguri. All movement of military, tourists and private vehicles has been restricted, and the state has been cut off from the rest of the country. 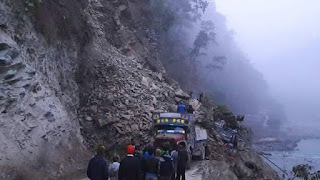 Sikkim Bengal border landslide stretches NH 10 kills many, The incident took place on NH10, 1 km away from the Bengal-Sikkim border, which is 75 km away from Siliguri.